Legoland - Malaysia... I Luv U..
Legoland Malaysia theme park, the first in Asia, is situated in Nusajaya, Johor. Situated on 76 acres of land, the park is the sixth such park to open in the world. Previous parks are located in Billund, Denmark (1968), Windsor, England (1996), California, USA (1999), Germany (2002), Florida, USA (2005). 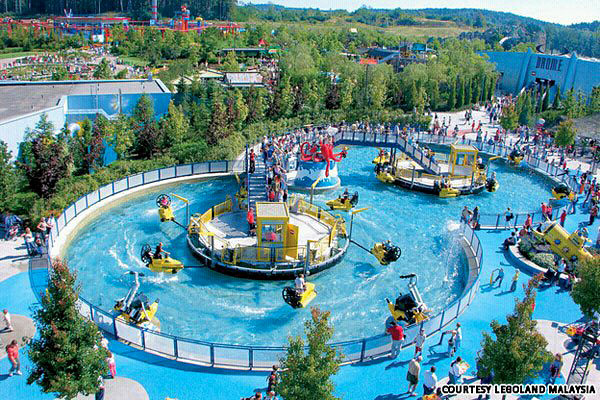 Legoland is built with over 40 interactive rides, shows and attractions. One of the main attractions here is the Miniland. More than 30 million lego bricks are used in the building of these monuments including the Petronas Twin Towers, The Merlion Statue, Taj Mahal and others. These well-known buildings are built using lego bricks, an interactive world on a scale of 1:20 where people, trains and aeroplanes come to life at the touch of a button. Other attractions at the park include Lego City, Land of Adventure, Imagination, Lego Kingdom and Lego Technic. In the theme park, there is also an Observation Tower which is the highest tower in Legoland Malaysia, some 60 meters from the ground. This is also the third Legoland observation tower in the world after Denmark and Germany. Legoland is a fascinating place to visit for children and adults alike! By Car From the north via the Kuala Lumpur/Tuas link. From the North-South Highway, take the direction exit 253 to Tuas/Nusajaya/Pontian/Tanjung Pelepas(this exit follows after the Kulaijaya/Kota Tinggi exit). Proceeding further, you will enter the Lima Kedai Toll (you must pay using electronic card) and proceed until you meet the Pulai Interchange. Proceed straight until you see the exit (312) to Gelang Patah and take the exit showing the way to Kota Iskandar. You should see the signboard to Johor Legoland before reaching Kota Iskandar. Alternatively, from Johor Bahru via the Coastal Highway. If you start from Johor Bahru town, take the new Coastal Highway to Nusajaya/Kota Iskandar from Taman Perling side. Proceed straight after the Toll House and take the exit showing Kota Iskandar. You will reach Johor Legoland before reaching Kota Iskandar. You can also get to Legoland from Singapore via the Tuas second link. Proceed until you see the Gelang Patah interchange and take exit 213 which will lead you to Legoland and Kota Iskandar.